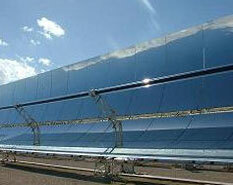 ISCC technology combines the benefits of solar energy with the benefits of a combined cycle. The solar resource partially substitutes the fossil fuel. The solar field is based on parabolic trough technology, clean, mature and tracked records that proves the technology to be installed at a large scale. The operation of a solar combined hybrid plant is similar to the one of a conventional combined cycle plant. The fuel (preferably natural gas) is burned generally on a combustion chamber of a gas turbine. The heat coming from the solar field is added to escape gases that direct to the heat retriever, resulting on an increase of steam generation and, consequently, an increase on electricity production on the steam turbine.